Olympic bronze medallist in judo “Rowdy” Ronda Rousey picked up her fifth MMA win and second as a professional tonight with a 49-second armbar submission of Charmaine “Not So Sweet” Tweet at Hard Knocks Fighting Championship: “School of Hard Knocks 12” in Calgary, Alberta. The bout, which turned into a grudge match as a war of words developed between the fighters in the week leading up to the fight, ended after Rousey was able to secure a takedown against the cage that led to the armbar mere seconds later. None of Rousey’s fights to date have lasted one minute. Rousey (2-0-0) became angered last weekend when she was forced to turn down a short-notice fight in Strikeforce against Sarah “The Monster” D’Alelio in order to fulfil her contractual obligation for the fight with Tweet (0-1-0). Rousey attributed the loss of opportunity to Tweet’s management, but the situation only seemed to motivate the Californian, who looked to take tonight’s fight to the mat right away. When an initial takedown failed, Rousey wound up on the bottom, but Tweet wisely wanted no part of the ground game and returned to her feet. Rousey followed and ate a pair of punches coming in, but managed to secure a judo throw near the cage and soon moved to mount on the ground. After a brief flurry of punches, Rousey spun into a quick armbar and Tweet was forced to tap out. The official time was 49 seconds of the opening round, moving Rousey’s pro record to 2-0. 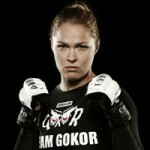 With a Strikeforce contract rumoured to potentially be up for grabs for the winner, Rousey may now receive the opportunity that she has been seeking since stating her intentions to challenge Strikeforce Women’s Middleweight Champion Cristiane “Cyborg” Santos by the end of 2011 following a bout late last year. With five armbar victories and none lasting longer than 57 seconds, Rousey has quickly risen to become one of the top female prospects at 145 pounds, if not in any of the women’s divisions today. man ihope ronda and sara mcmann end upin strikeforce , both of these girls won medal s in their respective sports (,judo , boxing)and are now crossing over to wmma. strikeforce keeps saying they can’t get fights for cyborg but both these girls would take that fight as soon as it was offered . they might not have as much mma experience but they havev world class skills, that transition over to mma. Sara McMann has an Olympic Silver Medal in freestyle wrestling and not boxing.